David Bernhardt’s confirmation hearing attracted a masked activist making a statement about Bernhardt’s previous work. Image: C-SPAN. The nominee to be President Trump’s second Interior secretary, David Bernhardt, has a lot of experience at the Interior Department. He has also represented the oil industry as a lawyer and lobbyist, and that drew a masked troll to his confirmation hearing Thursday. “Members of the committee, Good morning. 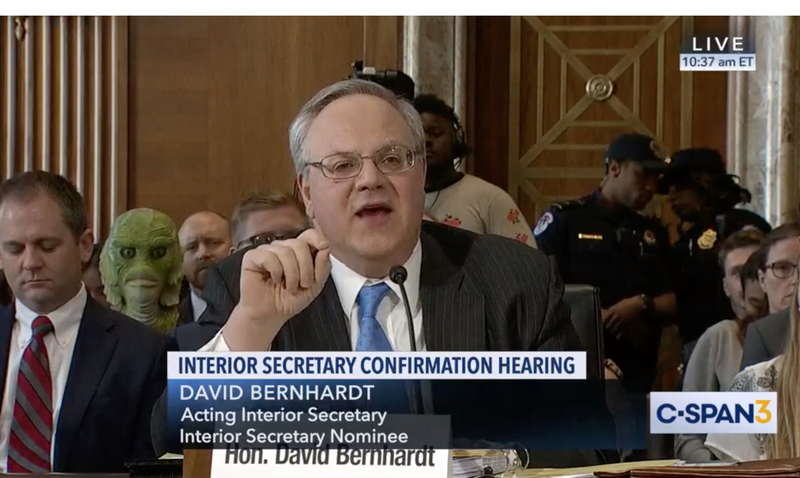 I am humbled to appear here today as the president’s nominee for the position of secretary of the Interior,” Bernhardt told the Senate Energy and Natural Resources Committee. In the audience, a few rows behind Bernhardt, a woman listened while wearing a green rubber or latex mask that covered her whole head. Space alien? No, this mask had gills: Swamp creature. Bernhardt is now the acting secretary, and he was the No. 2 at the department under President Trump’s prior Interior secretary, Ryan Zinke. Bernhardt also worked in the upper echelons of Interior during the George W. Bush administration. In between, he worked as a lawyer and lobbyist for oil companies and a petroleum industry trade association. Democratic Sen. Ron Wyden of Oregon pushed the swamp-creature theme, accusing him of using his government position to serve his former clients. Wyden was referring to a news story published last week by the investigative journalism program Reveal. Bernhardt said he’s consulted with the department’s ethics officials and is taking extraordinary screening measures to make sure he doesn’t meet with former clients to discuss matters he’s agreed to recuse himself from. “On a personal level, I have complied with my ethics agreement, the ethics laws and my ethics pledge, and I will do so in the future,” he told the committee. The image of the swamp creature seated among all the dark suits at the hearing made a brief splash on social media, at least for C-SPAN watchers. SPOTTED in the US Senate: a swamp monster! Also a person wearing a green mask, who appears to be concerned that the swamp monster could be confirmed as the next Secretary of the Interior. Fewer people noticed that directly behind Bernhardt sat someone who could serve as an ethics cautionary tale: former Alaska Attorney General Gregg Renkes. Renkes got a heap of criticism after it emerged he had negotiated a state coal deal that would have benefited a company he had stock in and used to consult for. An investigator concluded he did not violate the state ethics code but Renkes felt compelled to resign as AG anyway. He now works at Interior as the director of policy analysis. Energy Committee chair Lisa Murkowski wants to see Bernhardt confirmed. She said she likes how Bernhardt is managing the department’s vast acreage in Alaska, compared to how it was in the Obama administration. “I think we’ve gone from that landlord-tenant ‘can I hang a picture over here’-type of a relationship to one that is based more on a working partnership,” she said. Bernhardt appears to have plenty of support on the Energy Committee. After the committee votes, his nomination will be before the full Senate.